Ronald McFarlan came from a family with many scientists and engineers and where scholarship was encouraged. He became interested in science in high school, was an undergraduate at the University of Cincinnati, and went to the University of Chicago for graduate study in physics (1926-30). His advisor there was Arthur Compton. He also studied under Dempster, Michelson, and Monk. Some of his graduate student colleagues were Ernest Wollan and Darrell Froman. His dissertation was "The effect of an electric field on the X-ray diffraction patter of a liquid." 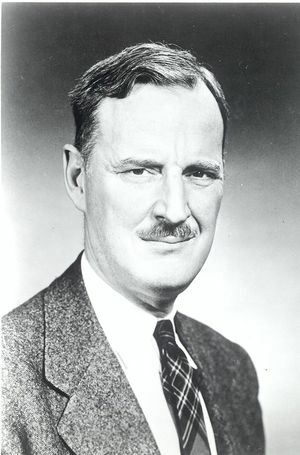 McFarlan received a National Research Council Fellowship (1930-32) and went to Harvard to study under William Duane. There he worked on the effects of X-rays on crystals, especially ice crystals — research he continued as a Harvard instructor in physics (1932-35). In this period he married Ethel White (1933), with whom he has had two children and two grandchildren. He decided to leave academia for industry (1935), since he felt an increasing interest in and challenge by the demands of practicality and a desire for tangible results to his work. McFarlan first worked for United Drug (to 1940), where he developed a multi-crystal spectrograph to measure vitamin strength, particularly Vitamin A. He worked for the United Shoe Machinery Corporation (1940-43), at their subsidiary the BB Chemical Co, working first on pressure-sensitive adhesives (for which viscosity theory was relevant), and then, as war work, on self-sealing material to make airplane gun turrets and windshields. He was director of research at the Bulova Watch Co. (1943-46), doing war work on the design of altimeters, Mach meters, and miniaturized instruments for airplanes. He moved to Raytheon in 1946, first as a consultant in a project making a handbook on pilotless aircraft, then as deputy (1948-1956/58) of the Raytheon research department, where he supervised 1200-1500 engineers and the equipment division. While there he was heavily involved in the process that first got Raytheon in to the computer business — the 1950 construction of RADAC, the Raytheon Digital Automatic Computer — which then resulted in the co-founding by Honeywell and Raytheon of the Datamatic Corporation. Starting in 1954, McFarlan also started getting active in the IRE. In 1960, he rose to be President. He became a consultant for Raytheon and Honeywell, spending most of his time as IRE president, but passing on knowledge he gained as IRE president to them in his capacity as a consultant (he was up-front about this, and let people know his dual interests). The union of the IRE and AIEE had some philosophical roots in the Unity Movement of the 1950s, which sought to unify different sorts of engineers. There were several years of contacts between the IRE and the AIEE before they pressed forward with the merger. According to McFarlan, the AIEE promoted it more, while the IRE — more successful by itself and less in need of unity — was more stand-offish. Serious explorations started in 1961. The decision and union came in 1962 when Pat Haggerty became president; he and Lloyd Berkner were the prime movers. There was some consultation with Western Electric and Bell Labs so as to get their influence behind the merger. Lots of the prime movers were associated with Texas Instruments and the Bell Labs, and didn't include many West Coasters. Nevertheless, McFarlan detected no conspiracy or ulterior motives in relation to the union of the two societies. For more on AIEE, IRE, and the merger that created the IEEE, see IEEE History. Ronald McFarlan, an oral history conducted in 1979 by George C. Sell, IEEE History Center, Hoboken, NJ, USA and Center for the History of Physics, American Institute of Physics, College Park, Maryland. We are conducting an oral history interview for the Institute of Electrical and Electronics Engineers and the Center for the History of Physics of the American Institute of Physics. We are speaking today with Dr. Ronald McFarlan, 18 December 1979, and we are in Belmont, Mass. at his winter apartment, and at this point perhaps it might be best to address the question of access and use. Before the tape went on of course we discussed the fact that this will be deposited as a transcript both with the IEEE and with the Center for the History of Physics at the AIP. Historians and other scholars will have access to this material, depending on how you would like to structure that. I see no reason why there should be any limitations on them whatsoever. Then you agree to open access. Of course this will be after editing, after you have seen the transcript and edited it in any way that you would want to. My only concern would be that of accuracy. Fine, very good. This project is part of the Merger History Archives project of the IEEE History Committee and is basically a project which is oriented around the merger of the AIEE and the IRE which formed the IEEE in 1963. However, the people that are being interviewed of course are quite prominent engineers and scientists, and we are attempting in these interviews to be biographical in our investigation. Now, to begin with, Dr. McFarlan, we know that you were born on March 8, 1905. We don't really know very much about your family background, though. Perhaps you could talk a bit about that. Who were your parents? My father was a Baptist minister named Frank Gressinger McFarlan. My mother's name was Mary Ella Henninger. I grew up in Cincinnati. My father died when I was 13. I had two older brothers and two sisters, one of whom was younger. We were all college graduates from the University of Cincinnati. One older brother was an electrical engineer, a power engineer, and spent his career in Cincinnati, as an employee of the Columbia Power System. The older brother was head of geology at the University of Kentucky for 27 years, Arthur Crane McFarlan. Upon his retirement he went to Florida where he currently is living, with his wife. An older sister was the wife of a civil engineer who was employed by the United States Public Health Service. His main function was to check on the health aspects of milk processing systems around the United States. He is no longer living but my older sister is still living in Dallas, Texas. My younger sister, Muriel McFarlan, was a teacher in the Cincinnati public school system until her retirement. She also lives in Florida. Your father, what occupation did you say he had? Well, he was a Baptist minister who also was very much involved in theological research of one sort and another. He had both a Ph.D. and an STD, meaning Doctor of Sacred Theology. The last, oh, 15 or so years of his life, he devoted mostly to writing one article or another. So your family background then, your home life was one in which scholarship was encouraged. That is correct, and I was encouraged to have full access to my father's library, which had many volumes in it having nothing to do with theology. I see. Would you say then that your interest in science and technology is really something that started at a very early age? Specifically science, yes, and more particularly physics. I had an uncommonly good high school physics teacher, in Cincinnati, and he was quite stimulating. In the public school system? In the public school system, yes. He taught physics in high school? He taught physics. Yes. He also had some very distinguished sons. One of them was president of Proctor and Gamble ultimately, and the other was I believe employed by the General Radio Co. in Boston. I forget their first names. I know the one who was president of Proctor and Gamble, first name was Neil. But he, meaning this physics teacher, really gave a first class course at the high school level. Was it more a physical approach or was it mathematics? It was a mixture of both. He had the ability to identify among his various students relative levels of ability, and keep them all challenged. The better ones were given much more difficult assignments than the others, so that they felt the need to work a bit harder, which in my judgment was excellent teaching. Yes. And this began what year of high school? Was this a required course, or did you find yourself in this course as a result of prior interests? No. It was not a required course. A science course was required, but it seemed interesting to try it, see what was there, and I found myself very interested. What I'm trying to get at is whether this was the original point of stimulation for your interest? OK. Then you went immediately after high school to the University of Cincinnati? And you obtained an AB in physics when you were 21? At the age of 21, yes. Then you began graduate education at the University of Chicago. Before we get to that, do you recall who were your primary teachers at Cincinnati? Were they good? Was it a good program? It was an excellent program, yes. One was named Moore, who was head of the department, and another full professor was very stimulating whose name was S.J.M. Allen. There was at that time a young assistant professor from Yale by the name of Solt who was well schooled in the theoretical physics of that day, and really gave a very excellent series of lectures to a very small group of us who were going on as physics majors. So therefore you had an opportunity, in working with this junior member of the faculty, to have your theoretical interests stimulated. As an undergraduate, yes. This was accompanied of course by a full sequence of mathematics. In parallel. Yes. This of course let you run a little bit. You weren't completely hemmed in by required courses. So you could follow your interests. It was also accompanied by participation at the varsity level in basketball, and by a Cincinnati College of Music flute scholarship, which also took a great deal of time. So between those three activities there was no time for anything else. I'm sure. And the graduate education then began in 1926 at University of Chicago? I had my doctorate in 1930, yes. I was the graduate student of Professor Arthur Compton. Arthur Holly Compton. Did he pick you up right away? No. My first year as a graduate student there, he was off traveling on a series of lectures around the world. His assistant, a man named Deardon , who later became professor of physics at Johns Hopkins University, was more or less guiding a small group of us who hoped to be students of Professor Compton when he returned. Had there been a selection process by this time? No. All of us kept busy by Professor Deardon, more or less being introduced to the types of things we would do — yes, we became students of Professor Compton. This was also accompanied of course by a full course schedule. Yes. And upon Dr. Compton's return? I was admitted to his graduate thesis guidance program. How many students at this point was he carrying as dissertation students? I will guess from memory — let me say six. That number may be off by fifty percent. On the low side. Did you have an opportunity to work on any of the research projects that Compton had under way? Not on his own, no. I went to him with, oh, let's say three or four possible thesis topics, and he selected one that he thought might perhaps be most useful from the point of view of research interests. And contributing to the general body of knowledge. Yes. Was it something that would be contributing directly to projects that he had under way? Would you say then that with Compton you had a certain unusual degree of freedom? That is correct — except that when it happened occasionally that I needed help, he was always available with excellent advice. Were there any other faculty members that particularly impressed you at Chicago at this time? A Professor Dempster, Arthur Geoffrey Dempster. I thought that his experimental programs were particularly well done. They were not in the field of X-rays where I was working, but I felt that they had ultimately great importance, as, a matter of fact, has been subsequently borne out, by the direction which physics research has taken. He was doing experimental work in particle physics. And along the general lines of measurements of such things as, E over M, molecular rays, the separations of particles by cross electrical and magnetic fields — that sort of thing. He had a good group of students who were doing excellent work at the time. That may bring us to another important direction we might take. Do you recall at this time in Chicago graduate student colleagues of yours that also went on to successful physics careers? Well, there was one named Wollan, Ernest Omar Wollan, who went with the Atomic Energy Commission laboratories at Oak Ridge, Tennessee, and had a very good career there. There was another one name Darrell Froman, Canadian, who went back to Canada and did some very fine work there. There may be others. These two names come to mind immediately. What was the atmosphere like at Chicago? Chicago was an excellent school, of course, and was I believe very well endowed at that point, largely with Rockefeller money. That is correct. The atmosphere, I felt, was excellent, very scholarship oriented. The research programs were well supported. And there was a sort of a spirit of enthusiasm that was evident at that time. I would like to point out that this was prior to the first great Depression of the early thirties. Yes. Certainly a period of relative prosperity, if not the most prosperous period prior to World War II certainly in the century. You have said that, under Compton's directorship, there was a definite sense of freedom. But there wasn't even the attempt to direct your research in areas that would be supplemental to his research? No. He would participate in it, only when I came to him, and, which I would do of course from time to time. He was available, and he was most helpful. Well, toward the end of your graduate training then, of course the Depression came along. It hadn't really started at the time I was given my degree at Chicago. At that time, I was given or appointed to a National Research Council fellowship, I decided that Harvard, under Professor William Duane, was the place where I would like to do it, and was accepted on Professor Compton's and Professor Michelson's recommendation by Professor Duane. I should have mentioned that Professor Michelson needed an assistant to help him in the last of his research programs, and so for six months I was detailed to work under his very close direction on his projects, which was optical methods of measuring gravity and changes of gravity, an optical gravity meter, really. It consisted of setting up interference fringes between two levels of mercury, whose levels would change very slightly under different fields of gravity as the instrument was moved about, and when calibrated would give an indication of, to a very very high degree of accuracy, gravitational changes. And that, I think, was probably the last of Professor Michelson's serious investigations, because within a year or two of that, he took ill, went to the Bahamas and died. But it was a very very interesting, and shall we say worthwhile, experience to be exposed to a mind of that caliber. How closely at this time did it parallel your interests? It more or less stimulated an interest in optics and, which was further enhanced by being an assistant to Professor Monk of the University of Chicago, who taught the optics courses at the University of Chicago during his summer programs. And that of course, in the actual teaching and in the laboratory supervision, resulted in an exposure to optics which was more extensive than any I had had up to that point. And optics remained your interest? Well, we might then — let me ask you for the record your dissertation topic and how that research had gone — you had worked closely, as you said, with Arthur Compton as your dissertation advisor. And as your dissertation topic, you wrote on "the effect of an electric field on the X-ray diffraction pattern of a liquid" under Compton. That is correct. Nitrobenzene was used as the test liquid, because it showed a very high optical Kerr effect. And the objective of the thing was to see whether a high electrical field would orient sufficiently these polarized nitrobenzene molecules to produce a detectable alteration of the X-ray diffraction pattern. With the experiment as carried out, and the apparatus then available, there appeared to exist a small effect which was in excess of the statistical limits of error. This was supported by a mathematical analysis, and appeared to be at that time a positive effect. With different apparatus and more sophisticated techniques, several years later, there was raised the question as to the actual validity of this effect. So far as I know, the problem has not been resolved one way or the other. Not to my knowledge. But I am so far away from that field now that I don't even read that literature any more. I am much more concerned with electronic literature these days. Then, of course, in 1930 and from 1930 to 1932, you held a National Research Council Fellowship. At Harvard. Yes. The year I was appointed, I was one of four postdoctoral students in the country. The nice feature about these fellowships is that one can select the academic research center where one wishes to pursue one's research work. — as well as the competence of the individual, as indicated by letters of recommendation. But also the standing of the university in which they wanted to pursue their research. They actually tended to collect at Berkeley, Cal Tech, Princeton, Chicago, and Harvard. I chose Harvard because of its outstanding reputation as an X-ray research center under the leadership of Professor Duane. So you were well aware of the research that was going on at Harvard. Had you had previous contact with the faculty at Harvard? No. Before I actually went there, I made a special trip to Cambridge, to talk at some length with Professor Duane. He very kindly showed me where I would be located and introduced me to various members of the Harvard faculty who, he felt, might have some interest in the sort of thing I was doing. This is after you had been accepted by the National Fellowship Board? After I had been accepted, yes — it was in the month of May, actually. The American Physical Society meeting in Washington was in May that year, and I went from Washington to Boston for this interview with Professor Duane, and from there back to Chicago. I see. Well, you had mentioned that it was Harvard's program in X-ray research that attracted you. Yes, particularly where Harvard had a 100,000 volt battery which Professor Duane had assembled because of researches in measuring with very great accuracy Planck's quantum constant, and the associated value of F. over M. It so turned out that the very constant voltage associated with this battery, as opposed to normal transformer rectifier techniques for obtaining high voltage, permitted more accurate measurements for some of the work which I was proposing to do on crystal structures and crystal effects in the general field of X-rays. — and the reputation of their faculty. Actually, the only other place I considered going at the time was Cal Tech, which also had an outstanding program. But I felt that Harvard had, for me at the time, areas of greater interest. Who sponsored you at Chicago? Did you receive a lot of support in your application for the National Research Fellowship? I was supported by Professor Arthur Compton and Professor Michelson, both of whom wrote supporting letters. Now, the NRC Fellowship funds, I believe, correct me if I'm wrong, largely came also from the Rockefeller Foundation? As I remember it, yes. However, that should be checked. Yes, we'll certainly do that. Now, if this is true, funding priorities were changing at this time at the Rockefeller Foundation, in the early thirties, tending away from physics toward greater funding of biology. In fact, it's been recorded that even Robert Millikan was having a cutback in his own research funding. Did this affect you at all at Harvard during this two year period? No. In fact, Harvard was very good about providing the necessary equipment which I needed to carry out my research efforts there. In fact, to enable me to continue some of that research, they gave me a series of three annual instructorship appointments, so that I was able to carry out a research program which actually extended over five years. Did you have teaching requirements during the period when you had your NRC Fellowship? No. I had no teaching requirements then. In other words — let me ask this. The NRC Fellowship was terminated at two years? It was terminated. That is standard. Then Harvard picked you up at that point. To be able to sustain you in your research. That is right, and at that time I began working very closely with Professor Bridgman. I see. So you remained there at Harvard as an instructor in physics from '32 to '35? OK, we were discussing the period of time while you were at Harvard as an instructor in physics from 1932 to 1935 following your National Research Council Fellowship, which lasted until '32. Basically how did you divide your time? You were very much engaged in research at this point. It involved about 12 hours of teaching, maximum. Yes. Preparatory time was not very great because the course level was low enough so that a reading of the material was adequate to prepare the lecture. My students were sophomores, Juniors. I see. And your research continued, of course. The research continued, and that obviously took a great deal of time. Of course outside the halls of academe, the country was undergoing a tremendous economic upheaval. So while you were an instructor in physics at Harvard, you met Ethel White? That is right. She was the daughter of a prominent Boston physician on the Harvard Medical School staff, by the name of Dr. Franklin White, and we were married on September 6, 1933. We have two children. Was Ethel White a student at the time? No. She had graduated from Wellesley College in 1931. With a degree of Bachelor of Arts. We've had two children, a boy Warren, born in 1937, a daughter Ethel Louise, born in 1940. Skipping a lot of intervening time, Warren is now chairman of executive education at the Harvard Business School. And a successful consultant. Ethel is the mother of two hopeful young boys going up through the private school system in greater Boston. I think that's adequate. I'm not going to expand as a doting grandfather, on tape. I think you deserve to. Generally speaking, though, academics fared pretty well in the Depression, largely by hanging tough and holding onto the positions that they did have. However, in 1935 you made a decision to leave Academe and embark on a career outside Academia? You entered upon an applied physics industrial career at this point. Why? What led you to industry at this point of great uncertainty? This is United Drug — as a physicist to build from the beginning a laboratory to do this sort of thing. And, fortunately, it was well supplied with equipment of my selection. That can always be very exciting. Bates, Philip K. Bates, Dr. Bates. He was working primarily in the field of vitamins, which at that time was a very exciting new biological research field. Coincident with that, I was designing physical apparatus and devising techniques for the physical measurement of the strengths of these various vitamins. Of course it had a very important commercial application, because when you're dealing with millions of vitamin products, the making of bio assays is extremely expensive. If you can establish an accurate correlation between the output of a physical instrument and the biological strength was measured, then you save enormous amounts of money, not only in testing time but in the costs of animal techniques, this sort of thing. As well as of course expensive and well trained personnel. That's right. Out of that came a photoelectric instrument which was capable of doing that for Vitamin A, and which was then introduced into routine Vitamin A assays on the production lines. We might want to go into a little more detail on that, but before we do, let me back up a little bit and just ask you to briefly tell me what your colleagues thought of your decision to leave Harvard and a very promising academic career? There was no problem. The pressure underneath, of course, is always very heavy. In other words, you have excellent doctoral candidates and National Research Fellows and so on who are looking for academic assignments, and the pressure for those academic assignments at the time was of course very heavy. Only in part. Only because, otherwise many people like to come to Harvard, as did I, because of the prominence and the excellence of the institution. So the desire to remain in Academia which was not faring too badly during the Depression, relative to other sectors of society, that was perhaps an element in the competition for academic positions. I found also that I had a growing interest in becoming practical. Maybe I didn't quite recognize it at the time. But it wasn't satisfied by — ? By purely basic high level scholarship. That had nothing to do with its importance. It was a matter of personal interest. No. It was more a matter of, I liked to do things whose results I could sometimes see, and the place to do that was industry. When was this occurring? How long had you been tending toward the more practical, looking perhaps more toward industry? Were you approached by United Drug or did you? You had learned somehow that they were interested? I had learned that they were doing this, and so I, unannounced, went in and talked to them, and that conversation led to several more. Well, we might want to talk some about work that you did at United Drug, and, while you were at Harvard, if we may back up a little bit, you had done extensive research in the structure of ices. And from those, working out the crystal structures of the various ices . Now, these ices exist under different conditions of pressure and temperatures and except for ordinary ice, which is Ice 1, are not stable — at room temperatures. They're formed under conditions of very high pressures and low temperatures, basically, and the phase diagrams describing the areas of stability were originally measured by Professor Bridgman as part of his general research program. Professor Bridgman felt subsequently that it would be of interest to have the actual molecular structure of these ices available. So he asked me whether I could do this if he would furnish me with the ice samples. This required the design of a special X-ray camera, to operate under very low temperatures, namely liquid nitrogen, and a transference of the ice samples from his pressure apparatus to the X-ray camera. This could be done because at low temperatures, namely liquid nitrogen temperatures, the ice forms 2,3,4,5,6, once formed would remain stable in these high pressure forms at ordinary pressures. Apparently the molecular motion of the molecules was insufficient at these low temperatures to disturb the crystal structures . So, it was possible to obtain powder X-ray diffraction patterns of ices 2, 3, 4, 5, and 6. Subsequently, on the basis of these photographs, it was possible to actually work out the crystal structure of ices 2S 3 and 5I. However, the powder scattering patterns, which was the technique used for all the ices, was too complex to analyze ices 4 and 6 from the powder patterns alone. It is possible perhaps, using Laue diffraction patterns, to gain sufficient additional information to analyze ices 4 and 6. This was not done, because of time limitations. So the information was made available as to the position of the various lines in all of these diffraction patterns, so that if anybody subsequently wished to work them out using modern techniques, as for example the application of computer redundancy measurements, possibly 4 and 6 could have been done. But that was where, so far as I know, this work stopped. I was approached many years later, in fact shortly after the end of World War II, by Professor Linus Pauling, as to whether I would make any photographs available to him so that some of his students could go on from there. Unfortunately, after the multitude of moves that became necessary during World War II, those photographs could not be located. Actually, on a trip to the West Coast, I sat down with Professor Pauling and one of the young assistant professors of geology who was working with Professor Pauling, and sketched out in detail how the apparatus was forged, the approaches that were made, the precautions that it was necessary to take, so that from that point on, this assistant professor could go ahead if he wished. This I don't know. I lost track of it at that time. Professor Pauling was interested because he had developed a new theory of very complex molecules, large molecules, and he had the thought in his mind that some of these diffraction patterns might be caused by superposition of these very large molecules on the diffraction patterns of ices 4 and 6, which had so many lines in them that it was almost impossible to untangle them. In fact, it became a question, in trying to analyze those two ice forms, namely 4 and 6, whether the lines I was seeing were actually there, or whether I was imagining them. For that reason I never published 4 and 6. I just wasn't sure. Would you want to pursue this? That in brief is the story of it. The details are in the published papers, and as I indicated, coming over from your hotel, I'm so far away from this now that it would require a major effort to get myself back to the position where technically I could discuss this at the level at which it should be treated. Yes, of course. Well, we can delete this entire line of questioning. I'll just follow it briefly for a moment out of my own curiosity. This has not to do with the ices, but with your relation with Professor Bridgman. At the Center for the History of Physics, there's a collection of — actually an archival box full of material of Professor Bridgman's that is titled "Crackpot Collection." Evidently he had extensive correspondence with people around the world and, for some reason, received an awful lot of mail and published works as well which he classified — and I think looking through them, rightly classified — as crackpot theories. Do you know anything about this? I'm sorry, I don't. My contacts with Professor Bridgman, aside from attending one advanced course of his in theory of crystals, which in itself was very fascinating, were confined entirely to these ices. I was not involved in his "Crackpot Collection." Well, it's a very interesting collection, because as an historian of science, we also want to know not only about the elite developments but — because the elite developments are merely the tip of an iceberg. Of course. In fact, it might be interesting — I don't know whether the number actually exists — as to what percentage of valid elite, as you term it, developments, to initial crackpot ideas — would be — what that ratio would be. I have no feeling for that number. It's always possible, from a crackpot idea, to stimulate an idea that is not crackpot. So one mustn't a priori condemn all crackpot ideas. Quite the contrary, I have a feeling, and we've never talked about this, this might have been precisely what was in Professor Bridgman's mind. Well, the exercise of taking plausible or semi-plausible theory, and then seriously disproving it, may itself lead to something else which has value. It's impossible in the very beginning to really know, and to dismiss it out of hand would be a mistake. I don't care. We're just speculating, reminiscing here. No, it can be very valuable, because it may be the case that many of the what we're now terming elite scientists, would want to receive correspondence from the marginal scientist, or amateur, even. For this one purpose, the primary purpose, of reading stimulating work from which a lot can be drawn. Now I guess we might want to pursue, if you wish, your experience at United Drug in some more detail. You said you had had the opportunity of building a research program practically from the ground up. Subject to the one limitation I had of their general applicability to the pharmaceutical industry, and more particularly to United Drugs' interest. So would you say then that you had freedom in research within the confines of say a mission? That is right, and would be expected, after a reasonable period of time, to come up with some things which might be useful. What was your first research activity when you went to United Drug? I had nothing to do with physics per se at all. Into the laboratory, where I had a rather sparse amount of equipment at the moment, having been there only a week, came the director with half a dozen to a dozen metal cellophane-wrapped boxes of chocolate, two-pound boxes. There had been, in the stamping operation which formed these boxes, a residue of the stamping oil left on the metal box and the cellophane stuck to this oil residue and produced an unsightly mottled appearance calculated to discourage potential customers to buy them in the drugstore. And, said the director, "Can you tell us how to get rid of this mottled effect?" That was not what I'd been hired for at all, and my initial knowledge of how to solve it was zero. However, I took them home that evening, half a dozen of these boxes, and posed the problem to Mrs. McFarlan. It seems that one of the techniques for taking oil spots out of fabrics is to dust the fabric with talc, rub it and then remove the talc and with the talc comes the oil. "Why not?" said Mrs. McFarlan. "Why not try this on these metal boxes?" So we took the cellophane off these half a dozen boxes, carefully rubbed the boxes with talc, wiped off the talc, put the cellophane back on it. It no longer stuck, and an attractive appearance resulted. Next morning I took the solution back, showed it to the director, who brought the manager of the candy factory over. It was demonstrated in the laboratory, and within 24 hours a production line was set up of operators, removing the cellophane from these 10,000 boxes, dusting all boxes with talc, wiping off the talc, repackaging with cellophane and shipping it out to San Francisco. As a project, this was not physics. No doubt about it, it pleased your employers very much. It did help the initial impressions considerably. Well, I see analogies here with something that I came across in the archives at Bell Labs, when H.D. Arnold, who eventually became the first director of research there, in 1911, just after leaving Millikan, having a very promising physics career, and deciding to go into industry, his first project at Bell was to mathematically analyze the ringer circuit. The bell on your telephone. But I got the sense from looking at this that it was, in a sense a test of his abilities — I mean, put him on something and not only test his abilities but test his willingness to take on something that perhaps might not be very interesting to a hot blooded, hotheaded recent graduate. Then after that you went on to hopefully much more interesting research projects at United Drug. One of the important newer manufacturing programs at United Drug was the manufacture of Vitamin A capsules. This involved running biological assays which at great expense had to be done outside by a separate biological laboratory. It would be economically very desirable if a physical instrument could be devised which would do this same job, in the laboratory, or on the production line. To do this, it would be necessary to correlate the output reading of this instrument with the results of the bioassays. No, as a measuring procedure, so that only with periodic bioassay checks, the reading of the meter itself could be used as a basis for clearing the shipment. The approach was one of first examining, through the International Critical Tables, the absorption spectra of various gases, to see whether it would be possible to isolate a single line of some gas, in the 3300 angstrom region, with suitable filters. It turned out that this could be done with a sodium vapor line, which at 3280 angstroms would produce a sufficiently intense beam so that it would he possible with photocells and filters to come up with a measurable result. This was done, after a very considerable period of equipment designing and testing and so on. And this instrument was then subsequently used in the United Drug organization for bio assays. It was, in order to meet government requirements, periodically checked with bio assays to insure the continuing accuracy of the shipped product, but in the meantime it could be used to check the general production output. The paper was published describing this equipment, I believe in the Journal Of Industrial And Engineering Chemistry. I think you've got a copy of that, haven't you? One of the early applications of this spectrograph was to investigate its use for analyzing Vitamin A materials, among other things, and to work out in detail the spectrographic characteristics of these Vitamin A materials. The — This resulted in a paper published in the Journal Of Industrial And Engineering Chemistry describing the procedures, the characteristics of the curves, and so forth. Again, this resulted in the use of tile spectrograph as a measuring device for various types of Vitamin A bearing materials, not only pure Vitamin A oils. It was used also as a means for detecting impurities, and if necessary, going to sources which did not have those impurities. I may not have mentioned that in this paper, but that was the basic objective. You did discuss this in "The Physics In Pharmacy" paper that you had written for the Journal Of Applied Physics in September '38. Yes. I was invited by some of my physics colleagues — since I was then in the pharmaceutical business as a physicist — to write a paper covering the general applications, as I then saw them, of physics to pharmacy. It was my idea originally. But I checked it out with one or two of my friends in the American Institute of Physics, and back came the answer: yes, we'd like it. So I wrote it. This was useful also from the point of view of the work I was doing at United Drug, because it gave me a broader perspective of where perhaps the opportunities for physics work lay. Did it stimulate new directions at United Drug? It did. Yes. Of course, one had to be very careful there. This was not a situation such as the Bell Telephone Laboratories, where the upper management was thoroughly sold, shall we say, on the applicability of science to their business. So you were still selling this. I was still selling. In fact, I have found, in all of my industrial work, that it was necessary to sell. This is particularly true, as we'll see later, in the consulting business. Because you'd be entering a company that didn't have a permanent unit. That, and also if the company invests in you as a consultant for a while, they expect tangible results in one way or another. We'll get back to that later. Well, this particular paper had an amusing sidelight. I'm referring now to the spectrographic characteristics of Vitamin A materials. I was a little weak in organic chemistry in my educational background. I'd had some. So I took an advanced course in organic chemistry at Boston University given by a professor named Philip K. Mason, who did a first class piece of work. This was a night course. At the time this paper appeared, he was giving his class a test. A grade at Boston University meant nothing to me but for exercise purposes, I was taking the test. As I was writing it, he came up behind me. "I read your paper this afternoon in the Journal Of Industrial and Engineering Chemistry. It was all right." End of quote. Very interesting. Alternating roles I guess at that instant. I don't think any of the other students in that particular course were publishing at that time. Well, then in another paper that had some interest was that, acetylsalicylic acid, or more commonly known as aspirin, was of considerable interest to United Drug, from the point of view of incorporating it in candies of one sort or another. The question was, to what extent one could do that, and how to control it and so on. So, I had run an X-ray study of various sugars for an X-ray scattering pattern, and from that, came information which resulted in a publication of a paper in — where did I publish that thing? Oh, the Journal Of Applied Physics. So, with the knowledge that you had of crystal structures of sugars, you were able then to incorporate the aspirin in, then do analysis of that structure and detect the stability or instability, the nature of the aspirin in this solution? These were the main publications that came out of this United Drug work. This laboratory was used also extensively as a testing laboratory of the physical properties of various materials, not the research but actual semi-production control. And I had people who did this sort of thing. It was also used on a consulting basis for some of the United Drug Co. subsidiaries. To mention one particular example, there was a problem involving the textile subsidiary of United Drug in Fall River, Mass. Which was? Do you recall? They made a product called Fluftex, at the United Cotton Products Co. in Fall River and the Seamless Rubber Co. in New Haven. The United Cotton Products Co. had developed a new material which involved a specially designed machine which would orient cotton fibers in a certain direction, and then coat them with a plastic. This resulted in a product which was in the length direction very strong, in the cross direction quite weak, so that it could be pulled and show considerable strength. It could also be torn, if it was in a transverse direction, and this had certain useful properties, particularly for masking tape. The Seamless Rubber Co. developed and manufactured pressure sensitive adhesives, and they had developed a masking tape using Fluftex coated with one of Seamless Rubber Co.'s unclear pressure sensitive adhesives. However, problems arose as regards the length of the time and uniformity of properties and so on. So I went in as a consultant, to try and help resolve these problems, and here was where I received one of my early introductions into corporate politics. Because, if something went wrong, it was always a problem of trying to identify accurately where lay the sources of the original problem. It was an interesting education. In any event, after some time this product was straightened out and went into large scale production. It also had one or two interesting side effects. Seamless Rubber Co. had a monopoly on squash balls. Since I was a devotee of that game, unintentionally I mentioned it at a luncheon one day to the general manager. On my way home I was presented with a dozen squash balls, courtesy of the management. They lasted long enough so that they were used up about the time my son took my squash rackets over to Harvard as a freshman. That was the end of my squash career. Now, let's just — the work with the subsidiary, United Cotton Products — that occurred when? Do you recall the year? That was during the period I was at United Drug. Let's say that was between 1937 roughly and 1940. Some time in that time span. It took about six months to solve that problem, not full time, but as it worked into other programs. It involved a very considerable amount of designing of new tests of one sort or another, which was my function, and then these tests would be carried out either in Fall River or in New Haven. Do you want to move on then to the period 1940-43? You were with the United Shoe Machinery Corporation in Cambridge. Yes. I was actually with a subsidiary of United Shoe Machinery called the BB Chemical Co. They were the chemical arm of United Shoe Machinery. Your work there was still in design research? Yes, pressure sensitive adhesives and all kinds of adhesives were their main function, and here again, it was a matter of designing test procedures, new types of equipment, and getting into some of the problems of the formulation of the adhesives, where one wanted controlled viscosities, a broader temperature range, the distinction between one part adhesives and two part adhesives and why. This involved some interesting aspects of viscosity theory, and a very large amount of rubber property testing of one sort or another. I published nothing there. I had fully adequate facilities, both personnel-wise and equipment-wise, yes. And I was also — since BB Chemical was the chemical arm of United Shoe Machinery, I was consultant to United Shoe Machinery as well. World War II at this time — and this is one of the reasons I was getting a little impatient with United Drug Co. — I didn't feel that I was really contributing very much, although there is an interesting letter you might — I know I haven't shown you this. In that connection, believe it or not, I was eligible for the draft. That was written by the director of research of BB Chemical. Before you read that letter, I should also point out that part of my work for BB Chemical, as a consultant to United Shoe Machinery, involved government programs of one sort or another, and more particularly, the design of a pressurized turret to go in what was then called the XB29, a new airplane. This was a turret remotely controlled or controlled by a gunner within the turret, capable of assuming a wide variety of directions, in three dimensions, so that an attached machine gun could be oriented. My particular aspect was the development of an outside shell, of the proper materials, so that if a machine gun bullet went through it at high altitude, the thing would be self-sealing. To retain pressure. This was done by taking a thermosetting resin and bonding it to a very thin sheet of an elastomer such as rubber or neoprene, this kind of thing with a very high degree of elasticity, so that as the machine gun bullet went through it, it would punch in the thermo-setting cover, such as a bakelite cover, a hole its own diameter. As it went up through the rubberized material, which was with a pressure sensitive adhesive bonded onto the inside of the bakelite — the rubber would expand under the impact of the bullet, so that when the bullet punched its own diameter, the rubber would immediately come back and be left with a very tiny pinhole, well within the capacity of the pump to take care of it. That's right — and was approved by their armaments lab. At the same time, and this was somewhat more exotic, I was asked to see whether the same thing couldn't be done for the windshield, visibly. Well, lucite would be the obvious approach, from the resin point of view, the hard cover. The question was whether it was possible to get a transparent elastomer which would stretch. The answer was, yes, in the laboratory it could be done, but the thing was still in such a high degree of advanced research, because it required extremely pure materials — any pigments of any sort would make it completely opaque — that although it was possible to put together small test samples, the war was over before we got to the end of that line, or at least my connection with United Shoe Machinery was over, as you'll see later. Anyway, there's that letter that was written, that you might with that background like to read. I may place this in the archives, one place or another. Was BB Chemical's work in the war effort under contract with NDRC? Was it NDRC funded? No. This was under contract with what is now the Air Force. It was the air arm of the US Army in those days. The US Air Force wasn't created until the end of World War II. But it was under contract to Wright Patterson, to Wright Field as it was called in those days, the armaments laboratory thereof. And they would simply contract out from Wright-Patterson. Yes, they contracted with United Shoe Machinery which subcontracted that part of the work for my services with BB Chemical, their subsidiary. See, I was an employee of United Shoe Machinery as well. Well, this letter is detailing the changing amount of war work, research work and production work for the war effort, of BB Chemical, and it details that for a page and a quarter, and then, explains that the registrant with the local board in Wellesley, Mass. Ronald McFarlan, was a highly trained professional employee, and that his time was devoted 100 percent to work on problems for the advancement of the war effort, and therefore he should not be drafted. "We therefore respectfully request that he be retained in the deferred classification." And you were? I am sure this letter is an example of many that were received by local boards, not all of which were successful. Then in 1943, and to a year after the war was over, you held the position of director of research at Bulova Watch Co.
Was this in a design capacity? Or are you moving now into a more supervisory role? That's an altimeter. Then there were more complex instruments still that were involved, one called a Mach meter so that a pilot could tell, as he approached the speed of sound, when he went over it, what his Mach speeds were. This was important because it gave him control on whether he would tend to stall out or not. And also, as he was approaching the sonic barrier. There are two different speeds, of course, Mach number on speed, and indicated air speed. Were there significantly different physical dynamics that would be involved in? It's a mechanical linkage system plus a pressure sensitive diaphragm and an air speed detector. I was also involved in the design of miniature electrical meters. They're very tiny little things. The Air Force was interested in indicating instruments which were very small, light in weight, and, reasonably accurate. There was a line of those developed. I'm sorry I don't have any of those here. Of course following the war, and continuing right now to the present, miniaturization was an extremely important aspect in electronics. Now, I wasn't involved directly in electronics at that stage of the game. It was more electrical-mechanical. I see. Would you say that the war effort was a great stimulant to miniaturization? Yes, it was a very great stimulant. Particularly the airborne parts of it. And I did a lot of work there, all of it at the time highly classified, so I had no publications. I got sort of a, shall we say, interest, along about 1946, in having a pass at the consulting business, which had intrigued me, as in my earlier positions I had dealt with consultants. It struck me that it might be an interesting sort of life. I hadn't appreciated the negative aspects of it at that time. I can detail those a little later. Anyway, at the end of World War II, 1946, within about a six month period, I decided I didn't like living in New York. And the quick way out, and at the same time being interested, was to contact Raytheon, which I did. Raytheon in those days was a highly questionable company, living from hand to mouth, wondering where the next financing was coming from. I didn't want to get tied in with them as an employee, and I worked out an arrangement whereby I would be in essence a retained consultant, particularly in a pilotless aircraft handbook — contained all of the factors, as then known, with the then technology that went into the design of a pilotless aircraft. This resulted in a large handbook. There was a large group working on this. When I say "large," I mean 20, 30 or 40 people, doing nothing but going around and interviewing aircraft companies, gathering information all over the country, with a secret Navy clearance, so that they could go right in and have access to all classified material up through the classification of Secret. This was under contract to the Office of Naval Research. And the bulk of my Raytheon consulting, I'd say over 90 percent of it, was involved with this group, in the early stages. How long did this project run? I was involved with it for about a year, a year and a half. It resulted in a publication, stamped Secret, which was distributed to all of the interested government laboratories and government contractors. Was this published about 1948? About. Of interest to me was that here was my first introduction to the electronic field per se. Here was where I learned my first radar, my first automatic guidance and control, my first sonar, all sorts of things that subsequently I administered at Raytheon. It's interesting that this is after the war. That is correct, because what I was doing during the war was in a somewhat different field. And the basic reason why I didn't want to stay at Bulova Watch, why I wanted to get back out of New York was, my roots were Boston and I wanted to work there. I have turned down many jobs elsewhere wholly on the basis that I didn't want to leave Boston. Well, it was felt by both Mrs. McFarlan and myself that coming to New York, from our personal private point of view, was a mistake. We were discussing the postwar period, post-World War II, and the fact that you at this point went more directly into electronics work. And radar research. Did you follow electronics and radar research during World War II, or was this relatively new to you? It was relatively new, and the entering wedge, so called, was a naval study program on pilotless aircraft guidance and control, which we talked about briefly just before the luncheon break — and guiding good young engineers, who were part of this program, was an excellent introduction and an education to myself in learning some of these things. Not only management but the technology as well. Because I had to read their writings in great detail. One gentleman I'll never forget — he was a good engineer by the name of Walter Grey, who'd been through — you never heard of him, but he'd been through the Western Pacific as a radar officer on one of the Navy ships, and used to talk happily about, how someday he would write, "Grey On The Radar." He never did, but his writings educated me on radar very much. Raytheon now, yes. Let's say roughly a year and a half. The man who headed it, Neils Edlefson got a position as a chief engineer of North American Aviation Corporation's research activity at Downey, California. He was an excellent engineer and physicist. And he took with him several of the good people of that Raytheon group. He asked me to come along at North American's expense. I spent a happy two weeks in California, but as part of this Bostonian philosophy I mentioned before, I wanted no part of Los Angeles as a permanent residence. So I evaluated in two weeks, as far as I could go, the guided missile program of North American Aviation. At the end of the two weeks, I spent a solid five or six hours with their director of research, telling him everything I'd learned or thought I had learned, etc. Wrote it down in great detail, subsequently sent in my report, which was promptly stamped Secret and I was told to destroy my copy, which I did. This was the law of the land. You can check on that. And he was really not only personally very good but really a first class engineer. He was appointed head of all of this departmental activity. At which time he gave me a good sales speech, wanted to know if I would come in as his number-two man. Working for him was a pleasure, and the answer was yes, and that was the end, for the time being, of my consultant status. I became a full time Raytheon employee on that basis. It was in this capacity then that you supervised twelve to fifteen hundred engineers and the equipment division. These are very round numbers I'm giving you. Now, subsequently Raytheon was reorganized. Charles Francis Adams became president. 1948, '49, in that area. Lawrence Marshall, who had been president, was out. It was one of these financial shiftings. Adams subsequently has been the controlling factor in Raytheon's phenomenal rise, although nobody knew it then. So there was formed a new equipment engineering division, and somewhere in here I can give you a brief description of that. Again, you can keep it if you want. The rest of this doesn't matter. But that is a very large organization. Tens of millions of dollars worth of business annually, or did. I don't know what they do now. Those were the key figures in it. Again, if you want it you can have it. Thank you. I don't see you here. I wrote it. Roughly that vertical sequence was the then hierarchy. That will also tell you the various divisional activities that existed. And this is from the Raytheon NEWS, December, 1958. That's right. I kept it as sort of a nostalgic thing, but — it's yours. I haven't looked at that thing, by the way, for ten years, until I got your letter and dove down to the bottom of a trunk in Marblehead. Not an unpleasant experience, I take it. Nostalgia can be enjoyable – Well, then your experience with Raytheon continued until 1956, and it was about that time that you got into consulting exclusively. That's right. Actually what happened was — to give you a little bit of that background — around 1948 or '49, one of my duties was to try and nose out new large scale engineering development programs, and I ran into one at Sands Point, Long Island, the Office of Naval Research, where they were casting about for a contractor who would undertake a study of the instrumentation of the Naval Air Missile Test Center at Point Mugu, California, together with the Air Force Test Center at White Sands, New Mexico. The Proving Grounds, yes. And the project engineer handling this was named Perry Crawford, subsequently at IBM, and a first class computer engineer. In the meantime, Raytheon had had a study program for the Bureau of Standards, financed by $50,000 to test the feasibility of digital computers as a scientific tool. Now, in those days digital computers were extremely slow. Nobody knew much about programming. And very few people, including IBM, were doing any work on it at all, hardly. But the naval people at Sands Point wanted a study for this which would include a large digital computer, which would result in a means of controlling the overall guidance systems of their test instrumentation range both for the Air Force and the Navy, and handle theoretical problems that they wanted to do. Also it included a long range microwave communications system, which would be tied in with their guidance and control setup. Well, this was fascinating, so all red hot, I came back, and before I could get anything out in the subsequent conference with Cap Smith, the head of this, he asked me a question. He'd like to go to New York for personal reasons, but did I know any really good reason why on business he should go? In other words, we didn't travel at Raytheon expense on our personal accounts, but if there was a really solid business reason, this was another story. Well, I told him about this Point Mugu deal. So he went down and cross checked what I had brought back, came back in agreement, gave me the job of putting it together. Proposal, to be submitted to the Office of Naval Research at Sands Point for a complete system, both for Sands Point, the Air Force unit, and for the Naval one at Point Mugu, California. Well, now, they had a limited amount of money. When I say limited, they had 1.8 million dollars on what was actually a 5 million dollar program. So it was agreed between Perry Crawford and myself and a man named Dave Schultz, who was Raytheon's financial boss, that we would put in a bid of 1.8 million dollars, pointing out very clearly to Sands Point that this was the entering wedge only. That these other things had to be done. Well, 1.8 was what they had to commit, so the contract was agreed upon. We turned the computer people loose. Again, compressing time, about 1950, say two years later, they had actually built and had operating a vacuum tube computer which, for its day, was the best in the country. RADAC. Raytheon Digital Automatic Computer. There was only one, and it was shipped out to Point Mugu, California. And there was a considerable amount of work on the side as well that involved the communications link between the various island stations of Point Mugu, California, a study of the transmission conditions and what had to be done about them, in the desert around White Sands, New Mexico, and so forth. Well, this led to the establishment of Raytheon's computer department. And about that stage of the game, the head of that department, Richard Bloch and Robert Campbell, the two heads of it really, decided they'd like to get into the commercial picture. Of computers, yes. It was very obvious that the field was almost unlimited. But it was also equally obvious that the commercial costs to do it, the dollars involved, were fantastic. The capital. Yes. At that time Raytheon had roughly 35 million dollars working capital to cover all of their multivarious activities. Or multitudinuous activities, I should say. And the answer was a plain flat no. Charles Adams wasn't about to approve that and tie up all of Raytheon's working capital in a venture like that. He'd have been crazy if he had. Smith got an idea and it was a good one. He had been invited by Honeywell off to a fishing camp of theirs up in the Lake country north of Minneapolis, and met some of the top executives of Honeywell, and conceived the idea, why not finance this effort on a 50-50 basis? With Honeywell. He threw the idea to Adams. It was discussed at length with Honeywell, and an agreement was finally made that Honeywell would put up the capital, Raytheon would put up the know-how, and Honeywell's share would be 60 percent, Raytheon's 40 percent. You can't have 50-50 in this case. One must be a corporate boss. And it was agreed, since Honeywell was putting up the capital, this would be the way to do it. Well, on that basis, the Datamatic Corporation was born, jointly owned as I've just described. Smith was offered a job to head it all up, but he was an engineer. He didn't want overall business supervision or supervisory responsibility. In other words, he didn't want to be general manager or president of it. There was a good man from Honeywell by the name of Walter Finke who did, and they made a superior team: Finke was a first class businessman, Smith was a first class engineer, and between them, they guided through I hate to say how many reefs, shoals, etc., this growing organization. Excuse me, primarily in the Boston section? In the Boston section about 1954 to start. I started actually as vice chairman of the engineering management chapter. The following year, chairman. The following year chairman of the Boston section. The year after that, director of Region 1, which put me on the IRE Board of Directors. Two years after that, I was president. This is compressing what was an ungodly amount of work in the meantime. But this was going on simultaneously with the Raytheon activity. And it just didn't make any sense. I wasn't giving enough time to Raytheon's activities as an employee to warrant my holding down the same job that I had with Smith, and his successor agreed with that. So the year I was made IRE president, Raytheon and Honeywell jointly supported my efforts for a year as a consultant, expecting me to spend the bulk of my time on IRE and feed back to both organizations the useful information I picked up in my various travels. And that put me in the consulting business. I see. So it was your involvement in the professional society that really resulted in — your consulting activity. The original thing that started it was being vice chairman of the chapter on engineering management. The chairman, we'll leave his name out of this, of that engineering management section, was not very good, so the following year it was possible to straighten things out a little bit better. You say that Honeywell and Raytheon were interested in information that you would gather? As part of your professional activities? Yes. I traveled a lot. I met myriads of people. What sort of information would the firms be interested in? Technologically — And, was it available publicly? I made very clear when I talked to these people what I was doing. They didn't care. They would control what they told me anyway, and what they showed me. But it did put you in a position to be aware of what was happening on the advanced levels? At the highly advanced levels, yes. Because I was talking to the engineering leaders of all of these countries, Europe and South America. I didn't get over to Japan, with a limited amount of time. Also coincidental with all of this was the planning or communications, society meetings and so forth. It was quite a complicated melangem [? ], multi-ring circus really. And during the course of that, I would write a variety of reports, which I have available for you here if you want them. They're not published, but nonetheless they exist, and they're not confidential. We would love to look at those. If you want to look at those you may. Consulting assignment, Datamatic division of Minneapolis, Honeywell, computer development direction, marketing strategies, directions in which the computer field was going. The same thing applied to Raytheon's computer activities. They hadn't completely given it up. Boston Safe Deposit and Trust Co.'s directions for future progress in the electronics industry. Arthur D. Little Inc., extensive consulting in the areas of electronics, leaders, companies, directions of advancement, markets. Thorough Medidata's computer division, multiphasic health testing systems based on computers. Avco Manufacturing Company, Missile guidance systems. Piccard and Burns division of Gorham Corporation, long wavelength communication systems particularly for government programs. Slater Electric, entrance into the semiconductor industry and ways to accomplish it. University of Rochester, engineering education problems, and future directions of engineering education. Polytechnic Institute of Brooklyn, the same thing. Roughly that's it. Broad background and your awareness of recent developments and research areas. That is correct. People would bring problems to me. Then after some amount of study, I would solve them. Another thing I didn't mention and should have, the Ford Foundation came to me. They'd spent a million dollars in the universities around the country, under the direction of the University of Michigan, trying to advance the use of computers in engineering education. The Ford Foundation wanted to know, what were they getting for their million dollars? Would I make the circular tour, talk at great length and come up with my own conclusions? Again, you can take that if you want it. The subject and title is, for the Ford Foundation report: "A Report on Evaluation of Ford Foundation Project at the University of Michigan in Upgrading Instruction in Engineering Education by the Use of Electronic Computers for Class Instruction." This is dated June 1, 1962. I went all over the country gathering information for Ford. That report describes it in detail. It's very old now and out of date, but at least that's what I did then. Well, of course I won't read it at the moment but it just seems to me as if it might be quite valuable as an historical document in terms of sort of documenting the situation with engineering education in '62. It's yours. At that time, yes, it would. It was well received by the Ford Foundation. Now, along the lines of engineering education, I was invited out to the University of Missouri to be the guest speaker at their honors awards banquet, and somewhere in here I've got a copy of the talk I made, which is along the same general lines. Here we are. I was younger in those days. This is at the point where you were president of the IRE. That's right. This is 1960. I was president at the time. This talk is titled: "The Role of the Laboratory in Electrical Engineering Training." You needn't bother to read it now. It's not too long. Again, you can have it if you want it. Thank you. Well, you have a long career in engineering management and very broad experience in dealing with engineers from the management point of view. We might want to talk a little bit, in a very general sense, about where you see the distinctions arising between engineers and physicists? Over lunch I mentioned to you the historian Derek Price who has argued that electrical engineering, electronics engineering is such a science-based engineering field that it's difficult to even talk about them as engineers. He prefers to think of them as scientists, as applied scientists rather than engineers. If you don't mind a curve like this — let's say physics, engineering — that's ridiculously simple, but it expresses the idea. Extremely. Differing emphasis on subject matter. Well, what are these differences in motivation? Emphasis on practical operating hardware, primarily. Once you get over into production problems, physics has relatively little to do with it. Once you get over into seeking for knowledge for its own sake, engineering has little or nothing to do with that. But one shades from one into the other over a very broad spectrum. Because they're both sharing in that knowledge. They're sharing in the same body of knowledge. It's how they use it. And it's like the distinction I mentioned earlier between chemical physics and physical chemistry. There is a distinction. There are broad areas where there is no distinction, and where one could happily publish his papers in either field's magazine. It does make a big difference in terms of training. No. I can take, and did, in my more active days, a physicist, and turn him into a good engineer. I can take, given the proper motive, or motivation, an engineering trained student, turn him into a good physicist. And it can be done quite quickly. Because the same educational base can serve either field. This was Gordon Brown, who was head of electrical engineering at MIT — this was his thesis. It was revolutionary at the time he brought it up. Brilliant thinking. He threw all the rotating machinery out of his laboratory at MIT, practically, and I'd hate to tell you the consternation among professors it caused, but he got Julius Stratton's, the president's, approval for it, and he trained his engineers mainly in theory and laboratory principles, his basic philosophy being, it was the function of industry to teach the practical art, because that changes with extreme rapidity, whereas the fundamental principles he taught them were time-invariant. He was dead right. Of course, there are a few funny stories that go along with that. When Tom Jones, currently vice president of MIT, went out to Purdue as head of electrical engineering, he took some of his brighter boys with him, and he ran into a bunch of old line rotating machinery electrical engineering professors who didn't like this new philosophy at all. — was taken into the laboratory to look at a motor generator set, and the old line professor asked (aside, Jack Ryder would appreciate this especially) — He asked "How do you reverse the direction of rotation?" "Oh," said the student, "all you do is invert the matrix." He had not been exposed to practical rotating machinery at all. And Tom Jones had some problems with this professor. By the way, the story was told me by Tom Jones in his home in Lafayette. Now, when you're teaching underlying principles, you're teaching physics. And he also laid heavy emphasis on mathematics. The role of mathematics in upgrading engineering. Well, I include in the term physics, mathematics, because mathematics is the descriptive language of physics. They're inseparable. I see. Let's talk about mentalities and modes of thinking a little bit. On the cognitive level, do you see where there are what might be referred to as clear analogies between scientific or engineering modes of thinking, and management? Now, I'm not talking about interests or attitudes, but modes of thought. Does an engineer make a good manager? Not necessarily. He can or he cannot, depending on whether he has certain other talents. The engineer doesn't have to have a tremendous emphasis on human relations, the understanding of human operations. Those engineers who do can be trained to be good managers. There are engineers who don't have a feel for it and should be kept strictly in the research laboratory. It makes a tremendous difference, mostly, particularly if you're administering a very large organization. You have human relations problems that tend to supersede the technical ones. If you get good people and can keep them happy, the technical problems will solve themselves, with these engineers doing the solving, of course. But if you can't keep them happy, you don't get very far. Yet for example, probably the best example of management of intellectuals, management of scientific personnel, is Bell Laboratories. Would you agree? Yes. There are others as good, but they are among the very best, yes. And perhaps were pioneering in this. They did a lot of pioneering. Very broad minded, and there again, they were understanding of what engineers could do what. — who had been very carefully screened, as they were promoted, for the evaluation as to whether or not they had management skills. If they had them, up the management ladder they went, if they wanted to. If they didn't have them, no. They wouldn't get anywhere management-wise. Then they could fashion the research situation to their own choosing. Oh yes. And you take for example the Bell Nobel Prize winners. Brilliant people, and deservedly got their prizes. But you never find them in the upper echelons of management at Bell Telephone Laboratories. Yes. But they are very few and far between. So you don't necessarily agree then that systematic and analytic thought processes necessarily correlate well with management control and bureaucratic gamesmanship? They may or may not, depending upon the particular individual involved. That is why, in any successful organization, it's so important to identify people and assess them correctly. If you can, you'll play a winning game. If you cannot, you lose. And the way this game is usually played, in the large organization, is you try these people out — and Bell Labs does this very successfully — in positions of increasing complexity and increasing degrees of responsibility. And let them earn their way. And in this way, sure they'll make mistakes. We all do. But the good ones don't make those mistakes very often, the same ones anyway. He becomes more of a systems man, if I can use the term. He knows less and less about more and more, and his breadth increases to where he moves over into sociology and psychology. Like any other administrator, I've had large numbers of people cry on my shoulder. This is the norm rather than otherwise. You have to keep them happy. Now, these are good people, good solid men, but like the rest of us, they have their problems, both internally and externally, and sometimes handling the external problem can be just as important as the internal one. Can one say that there are differing interests and values between a bench engineer and an engineer who has entered the management ranks? Yes. He looks at life somewhat differently. Broader scope. Less attention to complete detail. Planning farther ahead on a broader scale, and planning is an extremely important part of this, the ability to sense ahead of time what's going to happen, what directions things are going to take and anticipate them if at all possible. The good managers can. Well, let me ask you something that I intend to be somewhat provocative of more discussion along this line. Do you see where there might be a conflict of interest between non-management engineers and management engineers in a professional society situation? There are always conflicts between engineers and engineers. The professional ones conflict with each other. The management ones conflict with themselves, and there's cross-conflicts, yes. But I think that's good, because conflict is the incubator of progress. It doesn't bother me. It's how you handle the conflict that's important. Yes. But with the exception of perhaps two or three, the remaining number of the 14 man committee are all either clearly management people, presidents and vice-presidents of companies, or are directors of research for industry. Is the interest of the management engineer, an engineer turned management, the same in a professional society, such that he would give good representation to the bench engineer in a situation like this? Yes. Because this is where, in IRE terms, the professional groups came into the picture. They were designed to do precisely that. Here was where the high level technical papers were given. The conventions were so arranged that the bench engineer could come, listen, argue, debate. It was their forum and he could learn a lot out of it. But somebody has to put this whole thing together to make sure it's a smooth flowing entity, and this takes management skill. Now, everyone of these people you mentioned among the 8 or 14 as the case may be went through the incubator of being a bench engineer or bench physicist first. He didn't come in from the outside on that. He came right on up and had the basic experience, so he knew what the thought processes of these people were. But they've gone beyond that, in the sense that they were giving less and less time to bench engineering and more and more time to management organization. Well, one historian of technology, his name is Edwin Layton, in his book titled Revolt Of The Engineers — he argues that in the 1950s, in that decade, one of the primary interests of the engineer was the issue of collective bargaining, and if that's true, and I think that has to be shown, I don't think he shows it quite well, but if that is true, then, with the professional society being the primary means of representation for the engineer, as a professional, and the professional societies tending to eschew the role of the labor union, but nevertheless labor unions not really existing at this time for the engineer, to give him good representation in his relations with management in his corporate or industrial situation — isn't there a problem here with the merger being organized by primarily management people? I'm trying to raise this issue again of the conflict of interest. No, because basically all the merger did was put together two operating societies, in an essence. The image of operation that each one had separately — there are small detail differences between the two — but that was the basic philosophy, to reduce the waste that accrued from running separate yet conflicting conventions, from running separate yet conflicting publications, and from wasting the individual engineer's time with too many meetings, too many demands upon his time, skills and so on from a professional society point of view. Now, this question of unions, I'll be frank — no organization that I've belonged to, and there have been some pretty big ones, has ever had a union. Now, I knew that they existed at Sperry, that GE had one at one stage of the game and so on, but in general, it was the less good engineers, the routine ones, the ones that were worried about their job and so on, who tended to band together collectively for their own protection. The good ones, no. Had no need for it. Had no need for it. I'm not against engineering unions per se, and I'm pointing out the limitations of my personal exposure to them, but our attitude, in all of the organizations I've been associated with, has been, all we wanted was the good ones, and we would pay them what they were worth. If they had problems which might tend to make them want to think about joining a union, and so on, strong efforts are made to see that those problems are solved. I've had dozens upon dozens of conversations with engineers. They've come with individual problems. They sat down and we thrashed them out. Some we solved, of course, not all. Well, it may be the case that it was the less successful engineer who was interested, specifically interested, in having a union represent him. The ones who were exposed, to some extent, to technician competition, because the technical schools, and by that I mean these two year technical schools, were turning out some pretty good citizens. And they were never part of the engineering profession per se. In either of the societies, they were listed as associate members. Not until you had a full engineering degree could you claim to be a full member. Well, this is all going on in the fifties, and also perhaps a way for the professional societies to address this need expressed by some engineers, was found in what at the time was referred to as the Unity Movement, unity of the engineering professions. Of which the merger was part, in a sense. Yes. I'd like to get to that and perhaps we can lead up to that with discussing the Unity Movements because the AIEE was clearly a leading organization in the Unity Movement. It was not. It didn't have to be at that time. It was the more rapidly growing organization of the two and had the larger membership. And it also saw itself as a more science-based group. They had always been an organization which sort of stood aloof from other engineering societies. A united front in what sense? You mean an actually organized group as a bargaining unit? There was awareness. Oh yes, but, and a general agreement in principle that someday maybe it would make some sense, but basically, as a viable going organization the way it was — oversimplifying, why interfere with success, as it stood? I know that when the subject first came up, in the board meetings, and this was in the late '50s, at the time I was president, it was promoted basically by AIEE. Some of us in IRE, and more particularly Haradan Pratt, Lloyd Berkner — what's this Texas Instruments man's name? — Pat Haggerty, and myself, would thrash it out over the luncheon table from time to time. And we agreed, that yes, let's at least meet with these people. And it happened early in '61. And the result of that meeting was, let's explore it a bit. And then, we appointed four representatives from IRE, namely the four I mentioned, to meet with four people from AIEE, who were Clarence Linder, Warren Chase, Elgin Robertson and I think it was Hendley Blackman, and we met two or three times, off and on, during 1961. In other words, who was going to succeed Pat Haggerty as president of IRE? Well, we knew the man. We knew him quite well. It was Dan Noble of Motorola. And he was, on the last IRE board, meeting when it was sure that the AIEE merger was going through. As a token to Dan Noble, he was elected IRE president for 1963. Of course it meant nothing. He would have made a good IRE president, and if the merger had for some reason fallen aside he would have been the president. Well, who would you say then was the original prime mover toward merger? Was it Lloyd Berkner? Two of them — Pat Haggerty and Lloyd Berkner played as a team. And Lloyd was the '61 president, Pat was the '62 president. Then, as these meetings went on, it became evident that the base Institute of Radio Engineers should be made broader still, because on this group mentioned there were no West Coast representatives, and we had tremendously strong West Coast sections. So it was agreed that three members from each society would be added to make a 14 man board. And this was done. And along about the middle, roughly, of 1962, we decided maybe, since it looked as though things were favorable for the merger, we'd better decide on whom we wanted for the first president of IEEE, and it was agreed that the President of Polytechnic Institute of Brooklyn, Ernst Weber, was our man. Then the question of general manager came up, because George Bailey was so old, in his eighties at that time, and it made no sense to carry him on. Besides, between him and Hibschman, it was better to have neither if we were going to start off again with a brand new fresh society. Two or three people were contacted and weren't interested. Finally Don Fink was contacted. He was interested, and he was then asked to join the meetings of the 14 man committee. I want to get back to that, but who were the others that were considered for general manager? Would you want to mention? I think it would be better not. If you don't mind. If Pat Haggerty wants to tell you, fine. He was chairman of the committee. — people reading this thing, there might be bruised feelings, and it better not. Of course. Well, Don Fink had headed a joint IRE and AIEE committee that explored the merger question back in 1960. Yes. And Don was a good man for it — let me say that quite frankly, he was an excellent man for it. It wasn't the case that he was just brought in from the sidelines. Oh no. He had been an IRE president too and a good one. We might want to step back a little bit and talk briefly about the February 3, 1961 luncheon meeting that you had with the board of directors of the AIEE discussing mutual problems. The topic of the talk was the organizational structure of IRE, what its problems were, how it functioned, an analysis of its financial organization, from what areas funds came, the advantages of the professional group system as separate from the sectional structure, how the two worked in harmony, how provisions should be made for the encouragement and promotion and dissemination of technical information of all sorts that was germane to engineering and engineering science. And then this was followed by an open question and answer period. And the AIEE was quite a different animal. It was quite a different animal. The IRE in the early fifties, I believe it was, had gone through a reorganization. The AIEE had not. It was not structured for the fast breaking developments in electronics. That's right. This is precisely why IRE was as successful as it was, plus the fact that it had the great good fortune to have a sequence including Don Fink and Jack Ryder and Ernst Weber, highly brilliant able presidents. And all three of those are exactly that. Well, it's been argued that the structure of the IRE was much more democratic and decentralized. Only to the extent that the professional group structure spread the opportunities for — and I'm saying this with all respect — working level engineers. They're the basis of the whole operation. Had a chance to get at management of the institution, to participate in it, and if they so desired, according to their abilities, rise in the hierarchy. There were middlemen per se, but turned over quite rapidly — they either went up or not. And it was also much easier in that structure to facilitate the creation of new professional groups. That is right. And this was done with great frequency. Whereas in the AIEE, there were great problems with it. That's right. As a new technology or science came into being, very promptly its adherents would apply for permission to form a professional group, and this was almost always granted. I'm talking IRE now. That's right. It was more flexible. Talking once again in terms of merger, how did the two organizations perceive this gesture by you, going to speak before the board? I was very well received. It was a very harmonious friendly reception. They couldn't have been nicer. I didn't know that one had ever been made. Did they tape it? No, I don't need a copy of it. Thank you. This is my swan song today, our conversations. Well, at this point, did the AIEE perceive itself to be in trouble, relative to the IRE? It was my understanding, yes. But I'm looking at that from the outside now. I want to stress that, I was not germane to the inner details of AIEE operations. I heard rumors, and that was all. Were you aware that AIEE was having some problems? You weren't perhaps versed in the details of that. But it was pretty clear from student membership statistics, where the organization was going to find its membership resources in the future? Yes, and it was also pretty clear from faculty changes in appointments and shifts what directions were being taken, particularly among the really key engineering schools such as MIT. It was there that you could see clearly that the faculty was orienting itself much more toward electronics? Right, and the same thing was happening in Berkeley, at Stanford and so forth. — that's right, a reciprocal arrangement. I would talk to the AIEE and he would talk to the IRE board. This is correct. And he got a friendly reception too. Would you say then that on one level, one aspect of these mutual luncheon meetings, that there was a symbolic element toward merger? Now, it's also in March 1961 that Haggerty replaced Don Fink on the joint committee. Let me just ask the simple question, why Haggerty? Why was he coming into it at this point? It was known at that time. Oh, IRE knew its presidents two years ahead of time. How is that? How would they know that? The presidents were a closed society, had to be, because you had to train these people, and they were in office only one year, so they had to be exposed for at least two or three years to the board of directors and more particularly to the executive committee, where the detailed decisions were made. They were drawn from the board basically. Drawn not only from the board, but from the board through the executive committee to the presidency. And it was known that Pat was going to be the '62 president. Otherwise you can't have a continuing society that's a viable organization. You cannot have a democracy in a case like that. Oh sure, you go through the motions of election. We go through the motions of election for our own president, but the available number of candidates are very few. Purely democratic with large numbers is an unworkable situation. A limited democracy is another story. It's a highly workable situation, particularly if the avenues of access to the top are kept wide open, and a conscious effort was made in IRE to do just that. That was a problem in the AIEE though. It was much more a republic rather than a democracy. Well, in April, '61, the AIEE executive committee developed a consensus that a two man committee be formed, and the next day the IRE board concurred, and Haggerty and Teare were appointed. They met in Pittsburgh. In May, I believe it was, the following month. But meanwhile Berkner was meeting with Chase in Washington. That's right. They were the presidents at that time. Yes. And as we mentioned before, they were prime movers at this point. They were. That is correct. So was the Haggerty/Teare meeting merely symbolic? They were the incoming presidents? Or was there something substantive to that meeting? No, there was more substance than that, because various aspects were being explored. Now, I forget the details, but the Teare/Haggerty meetings had a specific agenda, as did the Chase/Berkner meetings, and they weren't the same agenda. Both exploratory, to be sure. With something of that magnitude, it's a good idea to spread the load a little bit. Well, the day after the Haggerty/Teare meeting, Berkner then acted to appoint the eight man joint committee. That is, to inform him and Merv Kelly, president of Bell Labs, that the merger process had begun. I was just wondering, what would be your perception as to why they were singled out to be informed? They were extremely powerful engineering leaders. And one was boss of Western Electric, the other was boss of Bell Labs, and if they could be persuaded that this thing made a lot of sense, their influence would be powerful and effective. Persuading other engineers to go along. There was a major selling job to be done here. Really a major selling job. And one that had to be accomplished with speed. Within a year or less, the IRE membership had to be turned around. This meant a lot of lectures all over the country. We all of us, on that committee, did a lot of traveling with precisely this in mind. He was also on the board of Texas Instruments. Right, as well as Hill also, and Hill is very much involved at this point. Is there a clique here that's sort of a Bell Systems clique that might have strong interest? Let me answer this only in this way: I don't know. I was not germane to the fact that such existed. But it's always the case that when you're doing something like this, you make maximum use of your friends whose past performance records you can predict, and count on. My guess would be — and this is purely guess — it would be only to that extent that one might call it a clique. That is the complete extent of my knowledge of it. I hadn't even suspected that in terms of being a clique. Certainly I knew what was going on, but to me it made eminent sense that everybody who could be rallied around this program, be done — one would take maximum advantage of all of one's contacts to accomplish this. I see, so it's more expediency. This is my personal opinion. Let me reiterate, I don't know. I see. Well, I'm going to want to pursue this a bit further, particularly with Haggerty. He's the man who would know. Yes, but for example, if there were clear interests — for want of another term we'll call it the Bell System clique for the moment — in sort of control and management of the merger process, sort of keeping on top of it and closing ranks at the top level so that you control the whole process and maintain your control through the process. Well, let's look at the people involved. On the actual committee, from Bell there wasn't anybody. Well, yes. Warren Chase is high in Bell Telephone — but that's a subsidiary. But that's Cleveland. That was Ohio Bell Telephone. It wasn't the controlling clique in the New York City area. And I can remember one or two meetings. Let's put it this way, a cynical way of looking at — and this is a terribly cynical way of looking at Haggerty's statesmanship — is as a surrogate for Romnes, Kelly, Berkner, and sort of running interference for the clique. Several of the really good engineers at Texas Instruments came from Bell Labs. I don't know. Literally I don't know. I'm being honest about this. I'm not covering. The rules of the road in this conference are I call them precisely as I see them. Right. Well, that helps. That certainly does help because it remains an open question. If the question were raised, does it exist? My answer would be, if we were in a court of law under oath, I would simply say, I don't know. I've had no information which would lead me either to suspect or not suspect it. I know at the time the meetings were going on, if it existed, I didn't suspect it. Well, would other executives have any reason to worry about such a thing if it was going on in the first place? Why worry — no, it was a smooth organization. Everybody was pushing in the same direction. Some high level Bell people were involved and that's all to the good. Dean Ryder in the interview seemed to soft pedal this, as he does basically everything — he's not a person to, you know, overstate things. He understates if anything. But he did raise the interesting question of the fact that, at the top levels of the two societies, the academics tended to be in favor of merger all the way along, and who really needed to be convinced were the people who represented industry, and that once they were convinced, and only once they were convinced, did the merger take off. I wouldn't deny that. In fact I rather think it's a correct statement. Well, I mention this at this point because it has implications for this open question. Let's continue. We don't have a whole lot more time. In September 1961 there was a meeting of the joint committee in New York. I believe this was the eight man committee. And this seems to have been the point at which Berkner was fully convinced that the merger would come about, and there's a letter in the Hibschman Papers where he talks about that, and he says he came away very excited about it and thought it was really going to be accomplished now. What were your feelings about this meeting? Did you have the same perception? I would agree with that. What little I remember of it. That was the meeting when the time table for the merger was set up. Then the next month, both boards met, and voted on the resolution to consolidate. Haggerty then asked you to accept appointment to two of the study groups. One was extra-society relations and the other international activities. Yes, of the new society. Yes. Was there close relations with the IEE in England with the IRE? Yes, very. I was over there the year I was president and was very well received and gave a lecture before an IEE audience. In fact, I did the same thing for the French society and several other international .societies. including the International Radio Technology Union. Put in French terms. That's not the way I pronounced it but nonetheless. Did you work closely with Haggerty through the merger process? Could you talk a little bit about his mode of operation? Other people I've talked to that were involved in the merger process have pointed to him as the true statesman of the whole process. They're right. He was. He was the leader, without question. What was his mode of operation? For example, the Hibschman Papers seem to indicate that he was a man of — I've not met him yet — that he was a man of great diplomacy. Great diplomacy and great dynamism, as well as a first class mind. Very. No, without Pat Haggerty, I have strong reservations about the success of the merger movement. Unless somebody else with the resources of Texas Instruments or similar organization backed, because he was using that quite effectively as a means for getting the various documents out and staging meetings and so on, and this was all very much in order. In other words, he did it and he did it very well. Another person who — of course we don't have the opportunity to interview him — Hendley Blackman was also, perhaps less up front but more behind the scenes, active in the merger process. He headed a nine-man subcommittee concerned with the merger of both societies; technical group structures. And of course after the merger this technical structure turned out to look very much like the IRE, and the AIEE people were agreeable to that because of the effectiveness of that structure. That is right, and the fact that the change could be made outside the built-in, shall we say, rigidity of AIEE, as a professional society. Well, Blackman — drawing again upon the Hibschman Papers — Blackman worked constantly behind the scenes with Haggerty and Don Fink in addition to his work with the nine-man subcommittee. Could you for the historical record — How much credit should Blackman be given in the merger process? Can you sort of assess? Well, I was unaware, since I was tending to my own knitting over in these other areas, of precisely what he was doing. So any comment I could make would be meaningless. I was quite aware of his presence in the actual meetings and his contributions there, but the work he did behind the scenes I don't know about. Pat Haggerty had better tell you that. I see. What about Don Fink? Don Fink was very active, after he was first approached and accepted this potential general managership. So he dug in and worked hard. At this time he was director of research at Philco. Why would Philco give up a man like that? Well, rumor or not, given that qualification, we can talk about it, I think. In what sense were they having trouble, to the point that they would be willing to give up their director of research to be the general manager of the new society? If you're changing your course of direction, you think things might have gone better than they did — you sometimes feel that a shift in very top management is the thing to do. This happens in business and sports and everything else all the time. Just simply the old hope that a new face, even though your old face is superb, will change things. It doesn't usually, but there's always that hope. Might upset the bureaucracy to the point where charisma can play a role in new developments. I don't want to say anything derogatory about Don. He's a first class citizen and IEEE is very fortunate to get him. Indeed. The merger process went very smoothly. It met its time table except for a two month delay — it was a very ambitious time table. But it met its time table except for perhaps a two month delay in the spring of 1962? when some criticism was voiced by the membership. And when a lot of us went around and talked individually to a lot of sections, in open section meeting, answering one question after another after another. All of us did that. Was this planned or was this in response to the criticism? Well, when the criticism first became evident it was planned that we go out and talk. And we did. At that stage, we were sufficiently steeped in the pros and cons of the whole thing and the background that we didn't have to plan any speeches. They came out automatically. Stand on your feet and talk. It was easy. Well, the most often voiced criticism — I may be wrong, this is drawing on the Hibschman Papers and there's always the possibility that they're not complete — but the most often voiced criticism was that the whole merger process was occurring too rapidly. Yes. And why not? Because we had that one year time table determined by the changing of personnel because of the structure which changed the individuals on the board. And we knew people would have to be educated, and this would take quite a while, and — no, I think it had to be rammed through if it was going to happen at all, and this is what was done. The representation on the merger committee was largely East Coast and Texas. Until it was expanded and the West Coast got in it, but that was done because mainly the East Coast-Texas people were the original ring leaders. Yes. Well, we know from statistics that economically and in terms of numbers of engineers, the West Coast was very important, particularly California. I wasn't talking about that. Everybody agrees with that statement you just made. Given that, why was there such limited or perhaps non-existent representation? Well, when you start off from the beginning, it's sort of a creep-crawl-walk-run deal. And it started creeping with the people you knew who were familiar with the background and so on, and then you expand it. The West Coast people came and said, "Look, we ought to be on this." The answer was, "We couldn't agree more. We'll put you on." Well, I'm thinking that possibly just geographical isolation might have been a factor here, in the early phase. In the early phase. Pittsburgh was easy to get at. Cleveland was. It was a longer trip in those days out to the West Coast. That was before the days of jet planes. And basically it didn't delay things too much. There wasn't any element of regional rivalry? I don't think so. Maybe there was in the very beginning, until they were put on, and then that all vanished. And they should have been put on. No question. Well, the San Francisco section — I'm not sure whether I'm using the right term, section or region, I believe it was sections, Los Angeles and San Francisco — became aware of the merger process under way, and wrote a rather subtly written note to Haggerty at this point, and I think only rhetorically argued that there was going to be real problems with Wescon, for example, and contractual relations with WEMA — Western Electrical Manufacturing Association, and that in fact Wescon would suddenly have to have representation of electrical manufacturers. And I'd say that this may have been just rhetoric, sort of arguing for representation by the West Coast in the merger. I know it came up at one of these meetings, and the answer was a very enthusiastic, "Yes, certainly, let's put them on. They have every right to be." You don't always — as of the moment when you're doing things, you can't foresee all contingencies or all possibilities, and the effort was more or less, get this thing going, and you can frequently do that with a slightly smaller group. The inertia is less. But the moment the question was raised, their representatives came aboard. Yes, so it was quickly put forward, at a meeting with Haggerty in Dallas. And then subsequently Walter Peterson was brought onto the board. Well, let me ask you a general question about the merger. Was the merger necessary? What would have happened to the AIEE if the merger hadn't occurred? There was talk, I don't know from what quarter, that the IRE would continue and perhaps absorb AIEE as one of their professional groups. That was talk. Sure, we all talked where we weren't being quoted, just sort of general chit chat, yes. But no, I think it was in real trouble, and whether it could have bailed itself out, I don't know The difference was, among other things, IRE had this highly successful New York show and it was providing all sorts of money. George Bailey was almost a genius in the management of it, as well as managing IRE. It was a very strong healthy growing viable society at the time. Well, when Walter Peterson was brought onto the board, there was a perhaps significant, I don't know, interaction that occurred at one of the meetings, where Pat Haggerty was urging that the new society be named Institute of Electrical Science and Engineering. And he was outvoted on that. In the subsequent meeting Walter Peterson simply, off the agenda, said he wanted to change his vote to Haggerty's, even though it didn't make any difference. It was a purely symbolic gesture on Peterson's part of joining behind Haggerty. It raises questions of the politics. You know, what really went on, at least in the open meeting, I think I remember this very clearly, it was in Dallas, — on the board were three or four or five possible names. And these were debated back and forth, and there seemed to be a rallying consensus about this current name, "Electrical and Electronics Engineers". There was a slight flurry, should it be called "Electronic" or "Electronics"? To "s" or not to "s"? Yes. But this as a matter of English, and we agreed, let's use the "s". I get the feeling that Haggerty's interest went back to the IRE's concern about science, the fact that it was more scientific. It was felt that this was a reasonable compromise. And the AIEE people went along. Then another big debate came on symbols. There was discussion about the symbols. Symbols yes. Haggerty came in armed with his Texas Instruments art department's version of potential symbols, which we discussed, made certain changes here and there; finally there was a good consensus on the present symbol, because it was felt that it was a reasonable compromise, between the IRE triangular pin, and the squarish type of AIEE pin, that the circular arrow and another arrow through it, represented IRE's main interest, electrons and communication — a good compromise. Everybody agreed. Again, Pat Haggerty pointed out, "Once you vote this, there will be no changing it. Once it's adopted and out by the boards, that's the end of it, because the whole mechanism is geared around that in perpetuity." Well, OK — I've run out of questions at this point. There are areas perhaps I've not covered in the merger process that you'd like to discuss? Well, there was the question of the international impact of this, particularly IEE was wondering about this IEEE symbol, and they had a meeting with their people to assuage their fears on that. In that area, we pointed out very clearly that we were thinking in terms of a single section only, London based, of IEEE, that this would in no way interfere with their sectional structure throughout Great Britain and Ireland, of which there were many. Was there ever talk of merger with the IEE? No. Then the same thing was sold in Paris, Frankfurt, Rome, I made the rounds, and also down in the circular tour of Mexico City, Bogota, Lima, Santiago, Buenos Aires, Rio de Janeiro and Caracas. And there was general agreement across the board on the whole thing. They asked questions on how it was going to affect their individual national societies, and the answer was, not at all, except that it will put the power of IEEE back of your own operations in your own countries and you'll still run them. This was acceptable. And that it would result in a greater flood of technical information into your own country. There was no trouble selling that concept whatsoever. I'd been exposed to these people before, in my activities as chairman of the international committee of IRE, where I was setting these things up in the first place. In 1961 I chaired a group which made a tour of Europe, working out relations with the European societies. Who was on that committee? Ernst Weber, John Henderson, Finley Carter, and Herre Rinia from the Netherlands. And we made six or seven stops, Stockholm, Oslo, Denmark and the other countries I've mentioned. It was quite a long safari. And we were received, in general, in a quite friendly manner. Some very interesting pointed questions were asked us. Somewhere in the files you'll find my trip report on that. I haven't found it in the Hibschman Papers. No, you won't. You should find it in the IRE collection. We don't have an IRE collection. I'm hoping that Pat Haggerty has a good amount. Oh, this is a crime, because two years ago, in a burst of keeping domestic peace, I threw out a lot of papers. Too bad. We were condensing at the time and there were good domestic arguments. But I threw an awful lot of my own consulting records out too at that stage of the game. They were of no further value. What you're getting here are some of the things I just refused to part with until now. They'll be in good hands. Oh, I'm sure they will be. But there were long involved consulting reports and so on that I had no further need for. At this point then I'd like to thank you very much for your time. You're very welcome. If you have any further questions, drop me a line and I'll answer them. All right, fine. We may have to do that. Later on of course with the ongoing project, we'll be interviewing other people and other issues may come up which you might help clarify. Very good, I'd be delighted. Well, very good day. Thank you. ↑ R. L. McFarlan, "An X-ray study of molecular orientation in the Kerr effect," Physical Review, Vol. 35, No. 2 (January 15, 1930), pp. 2XX-212. ↑ R.L. McFarlan, "Apparatus for X-ray patterns of the high pressure modifications of ice," Review of Scientific Instruments, Vol. 7, (February, 1936), pp 82-85. ↑ For example see, R.L. McFarlan, "The Structure of ICE III," Journal of Chemical Physics, Vol. 4 (April 1936), pp. 253-259. ↑ R.L. McFarlan, "A New Photoelectric Method for Measuring Vitamin A," Industrial and Engineering Chemistry, Vol. 95 (July 15, 1937), pp. 324-326. R.L. McFarlan, "Spectrographic Characteristics of Vitamin A Materials," Industrial and Engineering Chemistry, Vol. 12 (November 15, 1940), pp. 645-647. ↑ R.L. McFarlan, "Physics in Pharmacy," Journal of Applied Physics, Vol. 95, No. 9, (September, 1938), pp. 573-578. ↑ R.L. McFarlan and J.W. Reddie, "An X-ray study of acetylsalicylic acid when incorporated in certain sugars," Journal of Applied Physics, Vol. 11, No. 1, (January, 1940) pp. 80-82. ↑ American Rocket Society and the Institute of Aerospace Sciences merged in 1963 to form the American Institute of Aeronautics and Astronautics. ↑ IEEE merger archives, located at IEEE Center for History of Electrical Engineering, New York. Nelson Hibschman was the Executive Secretary of the AIEE until the time of the merger and collected much of the documents in the archive. This page was last edited on 28 January 2019, at 21:42.